Indian Naval Ship Teg, a Stealth Frigate of the Indian Navy, is scheduled to make port calls at Simon’s Town and Cape Town between 20th October and 10th November 2014. 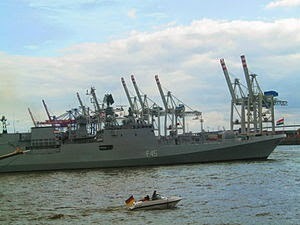 The ship will participate in the fourth edition of the biennial India-Brazil-South Africa Maritime (IBSAMAR) Exercise. The port call at Simon’s Town will coincide with the visit of Vice Admiral Anil Chopra, PVSM, AVSM, ADC, Flag Officer Commanding-in-Chief, Western Naval Command. Commanding Western Fleet. During the ship’s stay in harbour at Simon’s Town, various activities are planned including professional interaction between naval personnel. On departure from South Africa, the ship is scheduled to make a port call at Mozambique before returning to Mumbai in end Nov 2014. INS Teg, built at Kaliningrad, Russia was commissioned into the Indian Navy on 27th April 2012. The ship is a guided missile Stealth Frigate with formidable arsenal. The ship is commanded by Captain Anand Yeshwant Sardesai and is manned by a crew of 25 officers and 220 sailors.